At the end of February, Cabinet Office minister David Lidington delivered to little fanfare one of the most significant speeches made by any UK minister about the UK’s future after Brexit. He set out how Theresa May’s government’s will approach the thorny question of powers returned from the EU which fall within the jurisdiction of the devolved governments in Scotland, Wales and Northern Ireland, including those relating to farming, fishing and the environment. He maintained that the approach he proposed would allow the issue to be dealt with equitably, and expressed the government’s dual commitments to the devolution settlement and the integrity of the United Kingdom. The speech also included a low-key, but notable, shift in policy as he revealed that the government would work on the presumption that devolved powers should remain devolved once Brexit happens (rather than being held initially by the UK government). He stressed too the importance of protecting the internal ‘common market’ as he simultaneously made the case for the establishment of UK-wide frameworks in areas such as package labelling and hygiene rules. These should initially be overseen by Whitehall in order to ensure that problematic kinds of regulatory divergence do not ensue. Having already drastically reduced the list of issues where legislative frameworks of this kind would be required, and having offered this new concession in his speech, Lidington hoped he had done enough to assuage the concerns of Cardiff and Edinburgh that Brexit might entail some kind of resiling on devolution and a reassertion of authority by the centre. He was quickly disappointed. 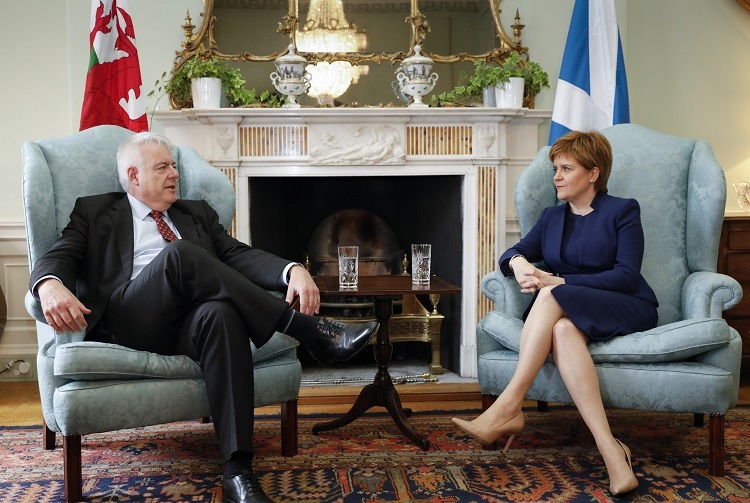 The first ministers of Scotland and Wales roundly rejected his offer and, acting with a striking degree of synchronicity, unveiled the next day emergency ‘continuity bills’ designed to ensure that these contentious powers would pass straight to Edinburgh and Cardiff. This move raises the possibility of legislation being passed that conflicts with the UK government’s Withdrawal Bill. As so often with Britain’s territorial politics, what appears like a rather technical, second-order set of questions in London, has profound symbolic resonance for countries whose constitutional position within the UK has been evolving rather unpredictably, and which are led by political parties deeply opposed to the policies of the May administration. The UK’s continued membership of the EU was baked into the statutes which introduced devolution in the late 1990s. 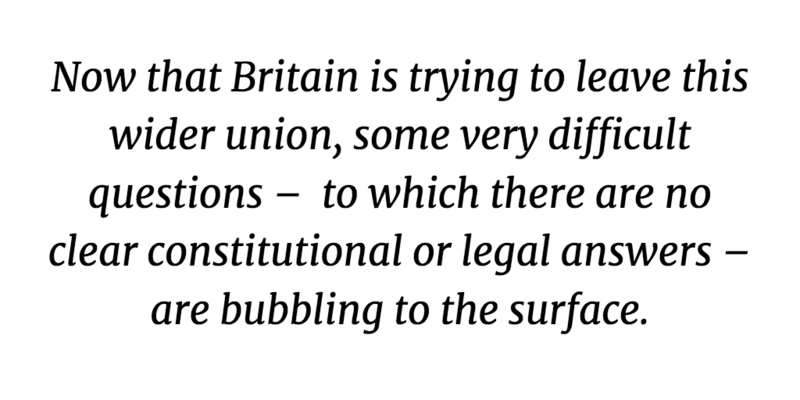 But now that Britain is trying to leave this wider union, some very difficult questions – to which there are no clear constitutional or legal answers – are bubbling to the surface. Clause 11 of the European Union (Withdrawal) Bill is the arena where these tensions are being played out. Its original draft would have prevented the devolved administrations from legislating in all areas currently covered by EU law until the long-term allocation of powers was agreed. But this idea was always contested in Edinburgh and Cardiff, which have held responsibilities for areas such as agriculture and fisheries since devolution, although both have been required to act within the constraints of EU law. The gap between the UK government and its counterparts is currently fairly narrow but still wide enough to allow politicians in Wales and Scotland to present themselves as the defenders of the national interest against the tyranny of London. Both governments have agreed to the principle of establishing UK-wide ‘common frameworks’ in key areas. For their part UK ministers have repeatedly committed to the idea of some EU powers being exercised exclusively at devolved level after Brexit, and have now backed away from placing a reservation on ‘retained EU law’. 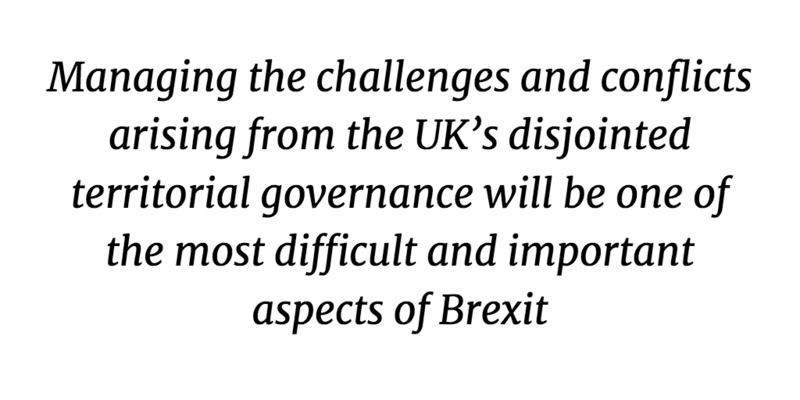 The main area of disagreement that remains relates to Lidington’s argument for the UK government to be ‘involved’ in areas where frameworks are proposed while these are negotiated, in order to ‘protect the UK common market or to meet our international obligations’. The exact nature of this involvement and how (if at all) it will be provided for in the the Withdrawal Bill was not specified. A deal may yet be achievable, but with the bill currently at committee stage in the House of Lords, time is running out. In the scenario that no deal is reached, the Scottish and Welsh governments would seek to pass their ‘continuity bills’ (for a discussion of these see here). These seek to incorporate EU law into devolved law, meaning that if it pressed ahead with enacting its Withdrawal Bill without the consent of the parliaments of Scotland and Wales, the UK government would be tearing up one of the core conventions of the devolution settlement and entering unchartered constitutional waters. Such a move might precipitate a new demand for an independence referendum in Scotland. With this in mind, May’s government has been prepared to make various concessions in its dealings with the devolved governments. Getting beyond the current dispute over Clause 11 matters a great deal because further, tricky intergovernmental negotiations relating to Brexit will soon be coming down the line. Even if the process for deciding on these new frameworks is agreed, fleshing them out will plunge these parties into complex questions of policy, with real differences of interest and perspective over, for instance, the needs of farmers in different parts of the UK, to the fore. Given the different political compositions and policy priorities of each government, this will be an immensely challenging process. If Theresa May wants to avoid a high stakes battle over whether the Scottish and Welsh parliaments will provide legislative consent for the bill implementing the final Brexit deal, further concessions over substance and procedure are likely. And as these come to pass, the governance of the UK will become yet more variable, and its internal territorial constitution even more disjointed. No wonder that those on the right who have perhaps never reconciled fully to devolution are starting to make their voices heard once more. 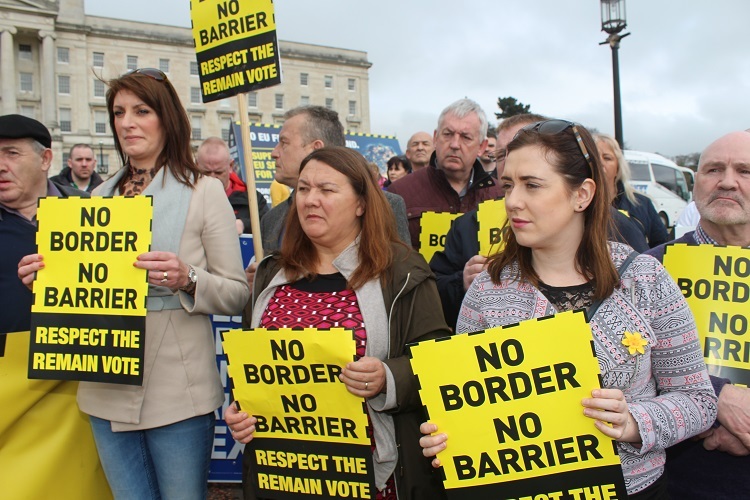 Managing the challenges and conflicts arising from the UK’s disjointed territorial governance will be one of the most difficult and important aspects of Brexit, and may have important long-term implications for the wider territorial constitution. As one of the research teams contributing to the Between Two Unions project, funded by the ESRC, we are seeking to understand these developments as they happen, and exploring the changing ways in which the UK government and the devolved administrations are engaging with each other. Further interim outputs will be published on this blog in the coming months, and you can read more about the wider project here. This article was first published on the blog of the Cambridge Institute for Public Policy. Michael Kenny is Professor of Public Policy at the University of Cambridge and the inaugural Director of the Cambridge Institute for Public Policy. Jack Sheldon is a Research Assistant at the Cambridge Institute for Public Policy, working on the Between Two Unions project.